This week Parliament finally got to vote on Mrs Maybe’s Brexshit deal. To the surprise of absolutely no one, Parliament rejected it. To the surprise of quite a few, it did not just reject it, it jumped up and down on it, kicked it in the goolies, cocked its collective leg over it and then dumped the putrid, mutilated, corpse into a skip. The losing margin of 230 was the largest Parliamentary defeat ever in the history of ever. But on a Vote of Confidence in the self-same Government that had just had its deal rejected, all the Tory MPs who had voted against it, including all the MPs who had voted against the Prime Minister only a few weeks ago, and the DUP, which had been screaming bloody murder all week, trooped merrily through the lobbies to support the woman whose bill they had so comprehensively trashed twenty-four hours earlier. Why? Because half of them did not want an election where the Will of the People could be tested, even though the Will of the People was what they were supposedly fighting for. And the other half of them did not want an election where the Will of the People could be tested, even though the Will of the People was what they were supposedly fighting against, because they want a second referendum instead, or simply just to scrap the whole thing. Meanwhile the Opposition, which did want to test the Will of the People, was actually offering the same option, i.e. Brexshit, as the Government it was seeking to topple, even though this is not party policy. Now the UK has 70 days to come up with something, anything, before the trapdoor opens, and Parliament will not vote for a No-Deal departure either. Instead, Mrs Maybe, who has repeatedly insisted upon upholding the Will of the People and delivering Brexshit, will probably have to postpone our departure currently scheduled for 29 March, or call the whole thing off. Or come up with a better deal, which she can’t. Not to mention that she kept telling us that no other deal could be obtained. Here’s the thing, Readers. Everyone is making a terrible fool of themselves, and we have become an international laughing stock. What is the point of it? This is not so much flogging a dead horse as attempting to ride it in the Grand National – it is a non starter. It is disqualified before it even gets to the starting gate, let alone the finishing line. Everyone knows it isn’t going to be happen. So why are we investing all this time and effort and expense in stabling it, grooming it, feeding it and advertising its next race? Why aren’t we taking it to the knackers’ yard and at least getting a few quid for the corpse? 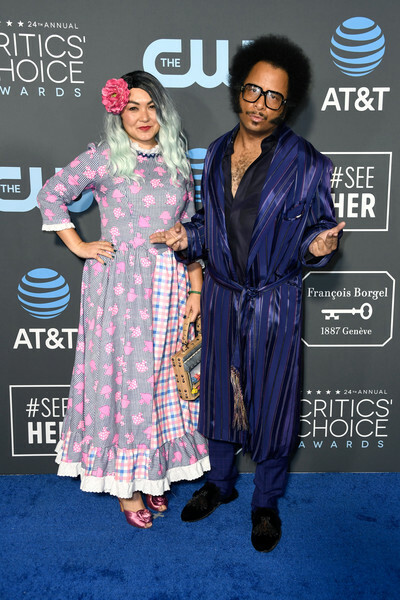 This week, our review of the week’s sartorial slurry comes from the Critics Choice Awards where a variety of horror awaited our appalled gaze. 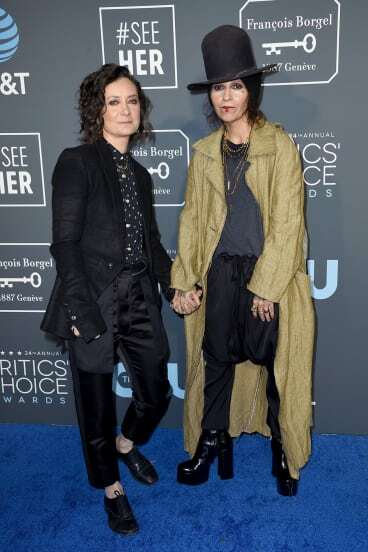 We begin with Roseanne actress and producer Sara Gilbert and her wife, singer Linda Perry. 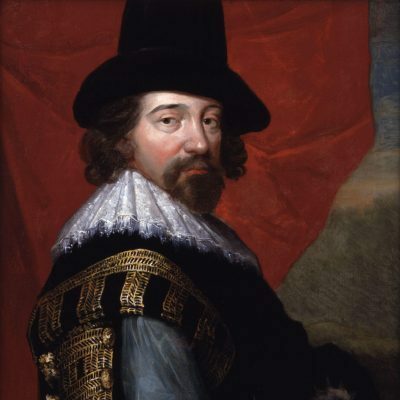 Sara has forgotten to brush her hair but otherwise passes muster but sadly the same cannot be said of her spouse, whose outfit can best be described as Sir Francis Bacon in platform boots and a flasher mac. And what’s with the mouth, like a giant cold sore? 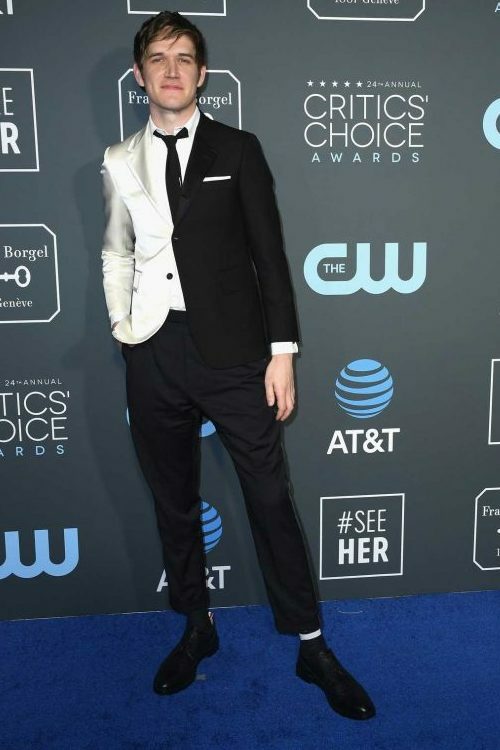 Director and comedian Bo Burnham wearing Thom Browne. Bo seems to have been sliced in half and put into two different suits and socks before re-assembly; the only things the two halves have in common are that the jackets are too short and the trousers have had a catastrophic fall out with Bo’s ankles. Actress Lucy Boynton wearing Gucci. This is just a bad nightie with very frilly tittage. Lucy should have got together with his director, Boots Riley, and his lady friend. She is dressed as an extra from Oklahoma! Boots (né Raymond) is wearing a dressing gown. For some reason, he took great exception to newspapers pointing out that he was wearing a dressing gown. WTF can clear this matter up. Newspapers pointed this out because Boots was wearing a dressing gown. He might as well have complained that they said he was wearing glasses. Actress Dina Shihabi, wearing Sandra Mansour. This dress is like a (rightly) discarded costume for a budget pantomime production of Ali Baba and the 40 Thieves. The whole thing is just terribly, terribly, terrible, but that glowing green inter-galatic thing around her hips looks positively radio-active. Actor Stephan James wearing Thom Browne. Thom Browne does it again. Stephan must have spent the night with people asking him to bring them another Chablis or more cashews. And why is he wearing combat boots? Actress Judith Light wearing Christian Siriano. He’s back again, and WTF suspects we will be seeing him right through Awards season. Here is Cody Fern wearing vintage Yohji Yamamoto and foul Maison Martin Margiela Tabi boots. Seeing as the suit is vintage, WTF did wonder whether the moths had got at it, but has since concluded that it was indeed designed like that so as to allow emergency access to the wearer’s pancreas. As for the Tabi Boots, WTF is sick of seeing them. TV host Carrie Keagan wearing Victor Lopez. Which is the more offensive? Is it the Minge Moment, or those tassels dangling from her shoulders like the entrance to a Kuala Lumpur knocking shop? 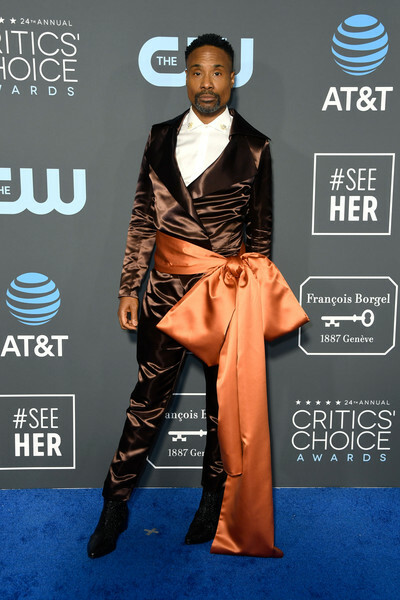 Finally, actor Billy Porter wearing Rinat Brodach. Sartorially speaking, Billy is the gift that keeps on giving and here he has gift-wrapped himself in brown silk more wrinkled that a Shar Pei’s bum and a bow big enough to encase the Statue of Liberty. This week’s It’s Got To Go is from WTF aficionado and stalwart Leslie from Lisson Grove, who has taken great issue with this male legwear and with very good reason. Are you ready? You won’t be….meet the concept of Mantyhose manufactured by e-MANcipate. I mean, the names themselves merit a slap before you even get to the horror of the picture. Why would anyone, male or female, want to wear something that makes them appear to have ulcerative colitis?. It’s Got To Go. This entry was posted in Brexit, Critics'' Choice Awards, Fashion, Fashion Disasters, Jeremy Corbyn, Uncategorized, Worst Dressed Celebrities. Bookmark the permalink. ps you’re biased because you used to own one. Oh dear God! This is only your second post of the New Year and I thought I was looking at your nominees for the annual Sumner Stinker. It’s only January. *Don’t know where to start. Each outfit was worse than all the others. How is this possible? I’ll have to confine my observations to taking special notice of the guy who gift-wrapped himself with the giant bow, and to Linda Perry for wearing the ugliest hat I think I’ve ever seen. *Mantyhose? Say no more. Ever. *Noticed a dog theme throughout your commentary today. 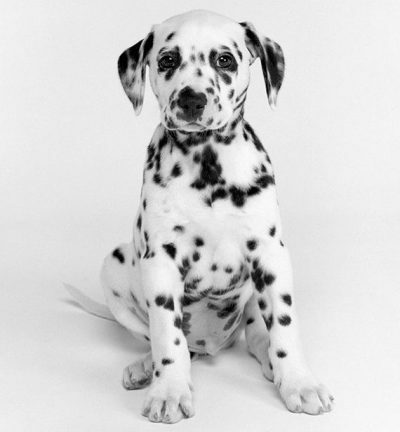 You’re treating man’s best friend rather badly by equating them with the fashions on display. 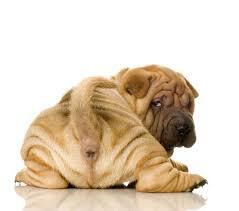 *And about that photo of the Shar Pei. I’ve been reading your observations for several years now, and I recognize an entirely justified if somewhat low-brow editorial comment when I see one. *I’m afraid I have to disagree with your contention that the Brexit process is making the United Kingdom a laughingstock. Unless he is removed from office, Donald Trump’s antics will be providing cover for the next two years. The Brexit debate can rave away in well deserved anonymity without worrying about witnesses. Here’s the thing. Carrie Keagan’s dress minus minge moment and tassels (what are those all about???) would actually have been rather lovely. Do these people actually look at themselves in the mirror? Ever? I love reading your weekly blog but as you get frustrated with people’s outfits, I get frustrated with your grammar mistakes. Today -Lucy should have got together with his director, Boots Riley, and his lady friend. Surely that should read- her director. Next -Everyone knows it isn’t going to be happen. Surely that should read – Everyone knows it isn’t going to happen. “Buzz Green” – any relation to Buzz Lightyear or Buzz Off or Buzz Cut? Or are they simply facile nominal inversions? It’s a blog, mate. Fings ‘appen. Homer nods. Give the writer a break, as the Septics put it.